Steal Their Style: 37+ New Bridal Looks From NZ Fashion Week! New Zealand Weddings Show at Fashion Week 2017 | Highlights from New Zealand Weddings Magazine on Vimeo. The New Zealand Weddings Show at Fashion Week was undoubtedly the most romantic show of them all – here's why. Missed our show at New Zealand Fashion Week? Not to worry, this highlights reel shows all the styles, suits, silhouettes and sophistication that's hot right now. See styles from the talents of Anna Schimmel, Trish Peng, Daisy, Hera Couture, Margaret Wray, Working Style, Jessica Bridal, Barkers and Modes. 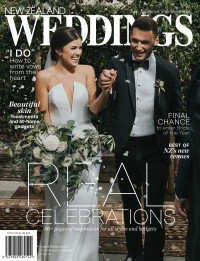 To hear more detail about suiting from Barkers and Working Style, and gowns from Jessica Bridal and Modes, click here. Press PLAY above to see what's new and noted for the next beautiful bridal season.